A convincing response on the survey carried out by Hope Spring Water confirmed that more sensitization is needed on menstruation and menstrual hygiene. 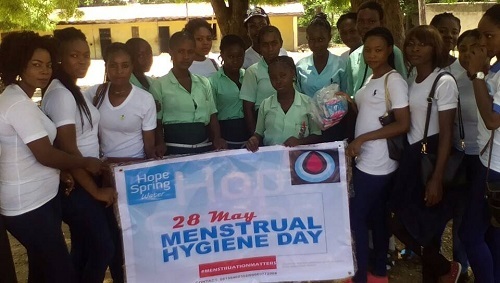 As a result, Hope Spring Water took the menstrual hygiene campaign to rural schools in Ajaokuta, Kogi State, Nigeria. Three schools – Longevity Secondary School, Adima, Community Secondary School, Geregu Village, and Government Science Secondary School, Ajaokuta – were visited. About 200 participants were reached with the help of volunteers from the National Youth Service Corps (NYSC) in Ajaokuta. The initial facial expression observed on the faces of the young school children when the word “menstruation” was mentioned, could tell the entire story about the perception of these young children on the topic. It was very obvious that most of the young girls were ashamed of their natural cycle and would rather not talk about it. The participants were educated on the need to be proud of their menstrual cycle. 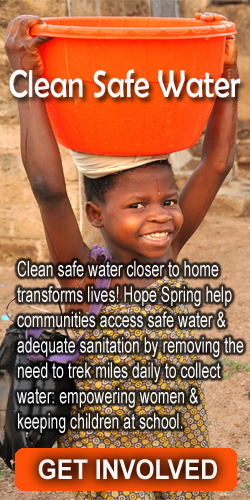 About 50% of the girls, who took the menstruation survey by Hope Spring Water, have missed school due to menstruation. Some of them are afraid of the reaction from schoolmates due to stench, which they believe is normal with menstruation. While most of the poor girls who cannot afford proper sanitary pads are afraid of been embarrassed due to leaky and uncomfortable materials, which they use as menstrual pads. The participants were educated on the need to be proud of their menstrual cycle. Emphasis was made on the importance of menstrual hygiene. 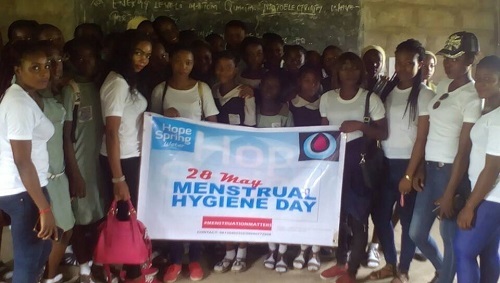 They were also educated on different menstrual hygiene practices, which would enable them, avoid embarrassments and regain their confidence during menstruation. At the end of the sensitization programme, sanitary pads were distributed to the girls who were proud to acknowledge that education about menstruation changes everything. In order to keep girls in school and help more girls achieve their dreams, the silence on menstruation would have to be broken. We can achieve more with more sensitization and donation to support menstrual hygiene campaigns.